Dr Edward Omane Boamah, the Minister of Communications, says government has not considered a ban on the Over-The-Top (OTT) services but is only finding a better way to harness its use. OTT service is the delivery of audio, video, and other media over the internet without the involvement of a multiple-system operator in control or distribution of the content. 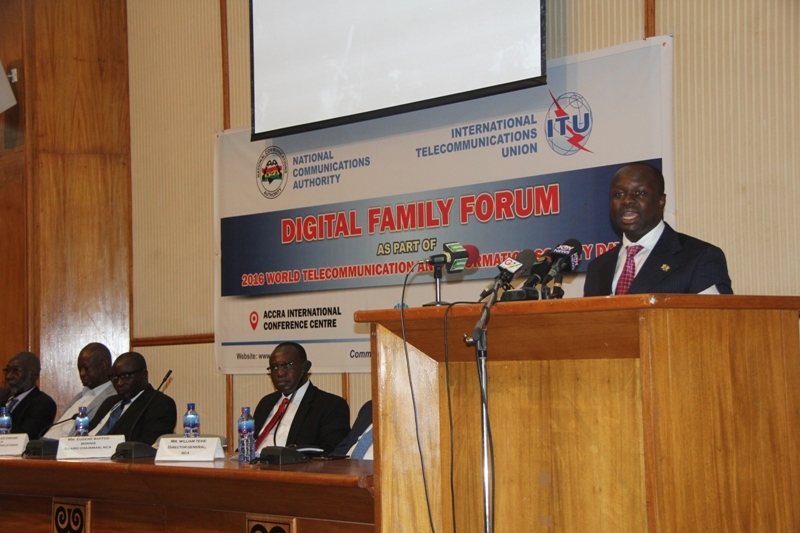 Dr Boamah was speaking at a Digital Family Forum organised by National Communications Authority (NCA) in collaboration with the International Telecommunications Union on Tuesday to commemorate this year’s World Telecommunication and Information Society Day in Accra. The global theme for the Day is: “ICT Entrepreneurship for Social Impact,” but Ghana is focusing on “Addressing Challenges of the Communications Industry to Promote Growth and Development: Focus on Domestic Roaming and OTT Services”. “We believe that as a merging trend, the regulator, together with operators and consumers, should find a middle ground which befits our peculiar situation. “To this end we wish to reiterate that we recognise the media as development partners and as such, we need your support in communicating accurate and verified messages to the public,” he said. The Minister said: “The reality of today’s telecommunication industry is that consumers are in control. Consumers love innovation, flexibility, efficiency, comfort, and more often than not, low-cost alternatives and will always seek them to enhance their livelihoods. “Our mandate should be to seek a balanced approach such that all stakeholders in this industry have their needs fulfilled. It is also imperative for us to learn from other countries and understand why they have or have not encouraged this trend of affairs,” he said. Dr Boamah said one major aim of the Government, beyond the efforts being made by the Ghana Investment Fund for Electronic Communication (GIFEC), was to consider the case for Domestic Roaming. He said traditional GSM Roaming is “the ability for a cellular customer to automatically make and receive voice calls, send and receive data, or access other services, including home data services, when travelling outside the geographical coverage area of the home network, by means of using a visited network”. “Domestic or National roaming is when the geographical area where the customer roams is within the same country as the customer’s mobile operator,” he said. The Minister said that implementation of such a transformation would stimulate, promote and encourage innovation and further provide the required quality of service while developing a reliable communications infrastructure. “This service will enable mobile users to switch from one network to the other in the event of network failure. Furthermore, this will ultimately be of an advantage to the police and other security officers in the event of crisis and mass information,” he added. Dr Boamah said government would continuously partner with stakeholders in all sectors to provide the appropriate environment to promote the adoption of ICT tools. He said this could increase the competitiveness of SMEs and enable the creation of more flexible links with trading partners because of faster and more reliable communication channels. The Minister, therefore, encouraged the forum to be open and honest as they shared ideas to make the discussions beneficial. “It is all about finding solutions to issues of concern so that Ghana becomes a winner. There should be no calcified positions,” he said. Mr William Tevie, the Director General of the NCA, who presented a message on behalf of the ITU Secretary General, Houlin Zhao, called on stakeholders to promote the role of small, young, and innovative firms in the ICT sector.